The TDC² 2010 awards have just been announced and I am very happy for two reasons. Firstly, my latest typeface Aisha, a multiscript Arabic and Latin typeface, has been awarded a certificate of excellence in type design. After Nassim’s 2007 award in the same category, I am very pleased that Aisha is seen as a worthy successor. And secondly, I am delighted for DecoType’s award for their stunning Nastaliq typeface. 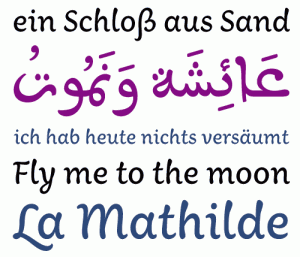 It is a long overdue recognition of their ground breaking work in Arabic typography – bravo! It is also remarkable that this year two Austrian designs are among the 16 winners – congratulations to the Typejockeys for their beautiful Ingeborg! And congratulations to the typographische gesellschaft austria, whose pioneering work in this country laid the foundations for such achievements! Yves Peters wrote an article on the occasion for his FontFeed, very eloquently putting this contest into the bigger picture.